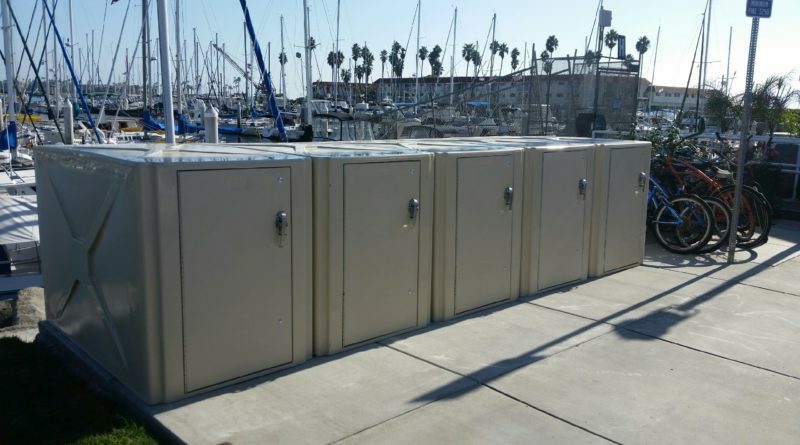 New larger storage lockers have been installed with plans to add additional units and restore three public bathrooms. OCEANSIDE — Oceanside Harbor recently presented a Capital Improvement Plan to provide more storage in the area as well as remodel three bathrooms in the harbor. Oceanside’s amenities, over the years, had begun to get a little tired. Ernie Prieto, co-founder of Oceanside SEA Center, shockingly revealed in early 2018, before the building was remodeled, there had been no running water for 10 years. Oceanside Harbor manager Ted Schiafone recently told The Log harbor maintenance staff has been very busy during the past fall and winter with a new capital improvement initiative to improve storage. All of storage units, which totals 20, have been rented out and additional storage lockers are on tap to be installed before the summer. The new storage facilities, according to Schiafone, are twice the size of the older models and are large enough to contain and lock two to three bicycles. Part of the reasoning behind the new storage units is to help beautify the harbor’s appearance and clear the decks of any burdensome items. “I can tell you that we already have a long waiting list for the next installment of storage units,” Schiafone said. In addition to the on-land storage facilities, the small and outdated storage containers on the floating docks will also be replaced. There have been complaints in the past about restrooms available to patrons in the harbor. Three restrooms are in the process of being remodeled and will include new plumbing fixtures, lights, windows, flooring, and interior and exterior paint. The first restroom to receive a makeover is located on the north side near F dock. Afterwards, the bathrooms adjacent to Nautical Bean Coffee Shop and near the fishing pier will be completed before the summer season. Oceanside Harbor is a unique in that is it the only harbor between Orange County and San Diego. Oceanside recently began an emergency dredging operation after, according to some reports, the city dropped the ball on applying for permits with the U.S. Army Corps. Harbor Village at Oceanside Harbor also hosts a variety of restaurants and retail shops. The New-England-inspired seaside retail outlet includes Oceanside SEA Center, Stratford at the Harbor and Lighthouse Oyster Bar & Grill just to name a few of the attractions. From the harbor, visitors can also rent boats, go whale watching, learn to surf, and more.